To prepare ice cream mold: Coat a 9x9-inch baking pan with cooking spray. Line the pan with plastic wrap; press the plastic into the corners of the pan allowing a 2-inch overhang, to remove the cheesecake from the pan after freezing. Prepare the cheesecake filling according to package instructions. Whisk in 3 cups of softened strawberry ice cream. Prepare the crust according to packaging instructions. To assemble: Evenly spread 1 ½ cups strawberries on the bottom of the pan. Follow with half the whipped topping. Gently spread half the cheesecake filling on top. Top with remaining whipped topping. Scoop dollops of the remaining 2 ½ cups of ice cream on top of whipped topping. Follow with remaining cheesecake filling. Sprinkle with crust and press into the cheesecake filling. Cover with plastic wrap and freeze overnight. Remove ice cream from mold: Pull plastic wrap up to remove ice cream from the pan. (For easy release, dip pan in warm water for 10 to 20 seconds first). Cut into 25 squares (5" x 5"). Stick one skewer into each square to make 25 lollipops. To make Strawberry-Blueberry sauce: In a blender, puree 1 cup sliced strawberries, 1 cup blueberries and ¼ cup sugar. Pour into a small saucepan, bring to a boil and simmer until sugar dissolves. Remove from heat and chill 30 minutes. Drizzle on top of each strawberry lollipop. 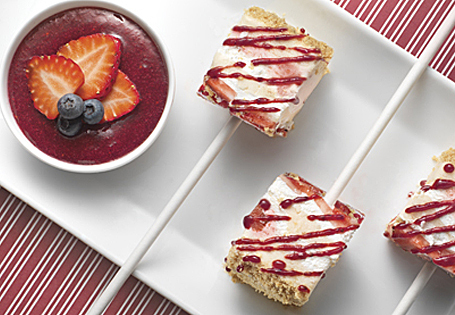 TIP: You will need 25 lollipop skewers for this recipe.